To secure a date on John's calendar, a 50% deposit of his fee is required. At this point, we will schedule a pre-program interview. 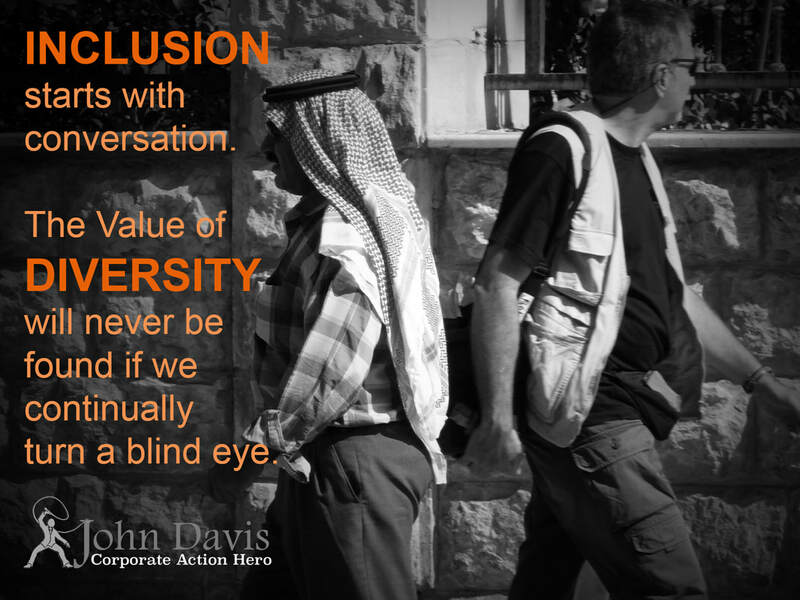 John will meet with you and others on your team in person or over the telephone. This discussion will help him to gain insight into your organization, event theme, meeting objectives and industry trends. Using this information, John will prepare a program that is personalized to suit your event. In advance of the date, we will also confirm the room setup, provide material for your program if needed, and continue to coordinate the details regarding John's travel itinerary, staging, shipping, and other logistics. A Corporate Action Hero program is always Fun, Exciting, and informative. From the first word of my programs your audience realizes they are in for a fun time. My background in comedy gives me a unique advantage for creating a fun and supportive environment. ​The use of a whip to deliver action-able content is an out-of-the-box delivery method. Why use a whip? Studies have shown that PowerPoint presentations actually turn off the part of the brain that in responsible for content retention. In NLP (Neuro Linguistic Programming) content retention is triggered by anchors married to the content. The whip being sonically loud and visually impressive, creates powerful anchors for content retention. The Nunchucks are a visually impressive anchor that demonstrates mental flexibility in times of stress or conflict. ​Of course whips and nunchucks have a reputation, and I am very careful with their use. In the many years I have been delivering these programs, I have never had a single complaint about the whip or nunchucks , nor has anyone ever expressed societal concerns. 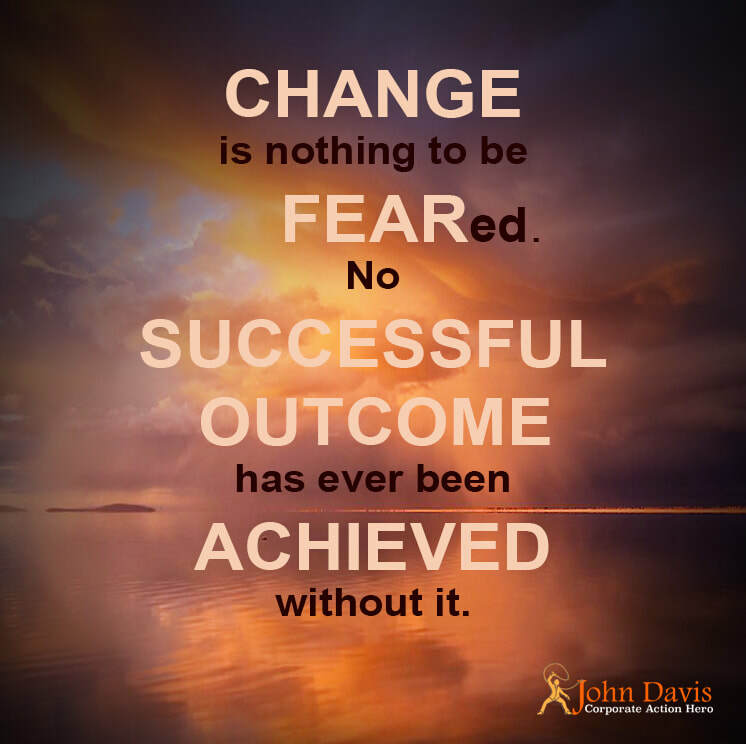 On the contrary, the feedback from the programs are aways positive and I am consistently thanked for delivering real "Ah Hah" moments that help individuals both personally and professionally. That in mind I do carry liability insurance for my programs and each client is forwarded a copy of the certificate prior to the presentation. Corporate Action Hero Programs are not gender specific, however, I am very aware of the implications of any perceived inappropriate behaviors or actions. When choosing audience members for on stage interaction, I never mix genders if they will make contact with each other. When teaching the whip I always ask permission on stage before touching anyone specifically to show best practices. The programs are designed to empower audiences and anything that could derail that mission are omitted. ​The programs can be life changing especially for those who are brought on stage. Those people are made fun with, not made fun of, ever. That said, I also understand the importance of hierarchy within every organization and never bring leadership team members to the stage unless specifically asked to include them. When choosing audience members, I rely on my decades of stage experience in my decision making. The people who you might think would be fun to have on stage are usually not. If they are the "office clown" they are a horrible choice as they can quickly derail the program which will have an effect on its effectiveness. Please provide a clear (stage) or area measuring a minimum of 12 feet deep by 16 feet wide. ​ Minimum ceiling height of at least 12 feet. Please do not schedule the presentation during meal times or dessert. The programs work best either before or after meals. Please avoid splitting the audience in two with John in the middle. Aisles are fine. 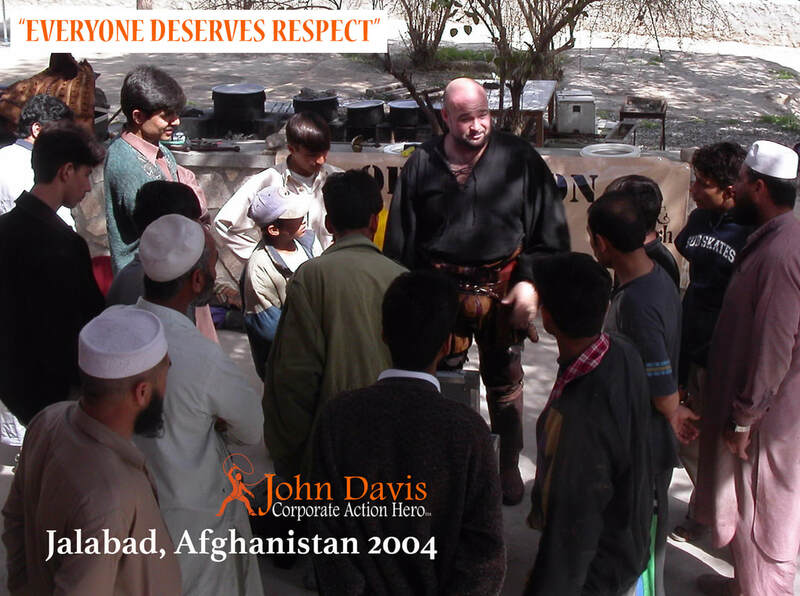 John Davis is an internationally known Speaker, Comedian, Fight Director and Action Hero. As an international entertainer, John has traveled extensively throughout the world speaking to audiences of all ages and backgrounds in 28 countries and over four thousand live performances. 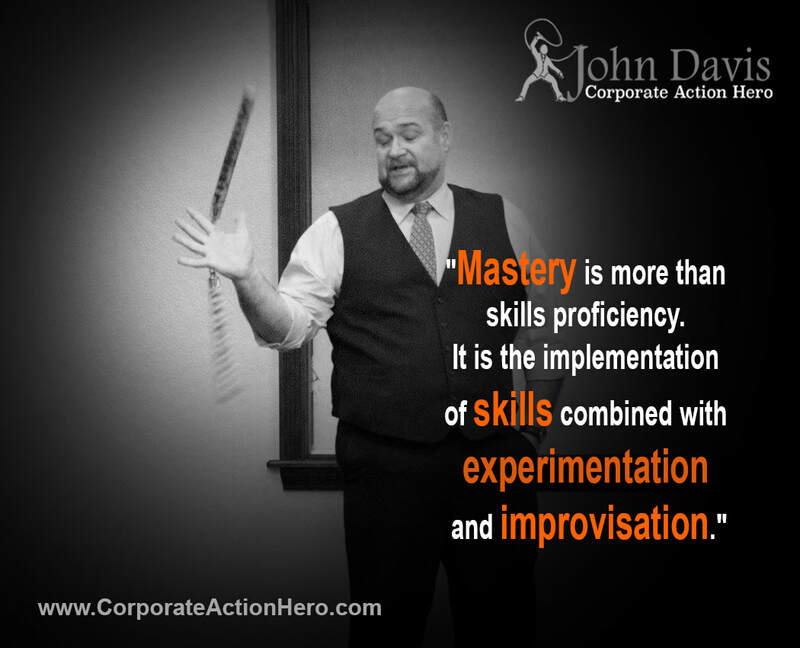 John encourages his audiences to set and reach their highest potentials and is often invited back as a peak performance coach. Since the tragic events of September 11, 2001 John has dedicated a great amount of time bringing entertainment to the soldiers overseas. On six USO tours, John has performed more than one hundred shows and has taken his comedy to even the most remote bases in both Iraq and Afghanistan. As the Artistic Director of four regional theme parks across the nation, John developed a reputation for reversing negative trends. Under his leadership, the parks witnessed growths of up to 60% in a single year's time. "I'd like to introduce our speaker. John Davis has lived the life of an action hero. He has been a professional Fight Director and stuntman for stage and screen; An Artistic Director of three regional theme parks; A sword-fighting comedian, and a motivational speaker, author and coach. He has been featured on the Today Show and the Discovery channel. 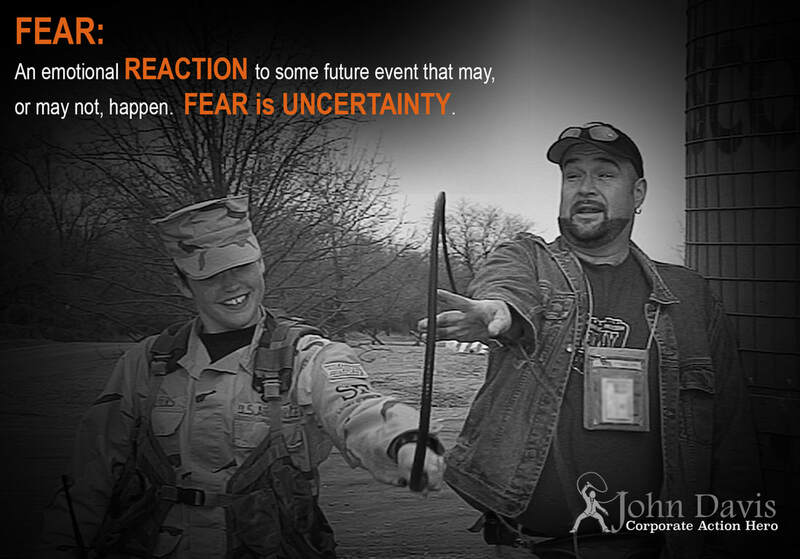 ​Since 2001 John has brought his inspirational message to sixteen countries around the world including the front lines of both Iraq and Afghanistan on six USO tours. 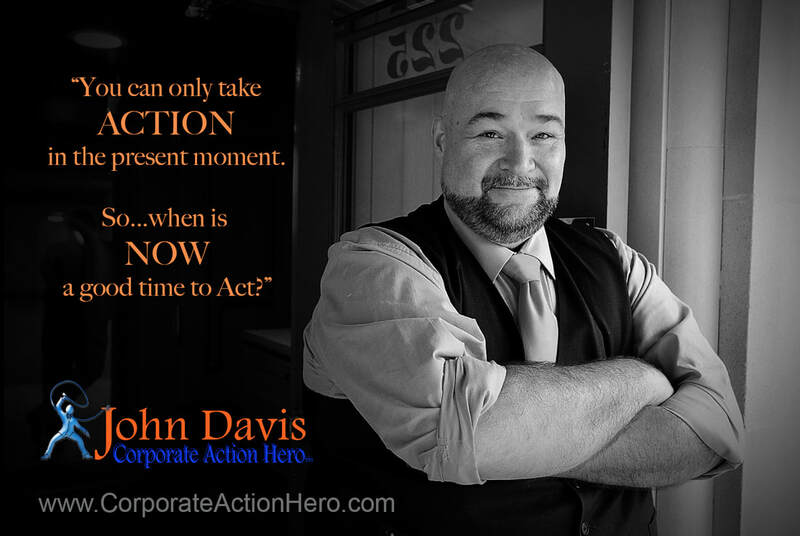 Prepare to become Action heroes and please welcome John Davis..."